When accessing your Desktop remotely, it's best to have a Domain Name for your router. The Dynamic Domain Name System (DDNS) feature on a Linksys router is useful especially if the Internet IP Address from your ISP is DHCP or dynamic. To save you from the hassle of identifying the current IP Address assigned by your ISP, you can sign up for free one (1) year DDNS service from TZO. TZO is a premium service that enables you to configure the Dynamic DNS in your router’s web-based setup page. NOTE: This feature is very useful if you want to remotely access your files and programs in a computer outside your network through the Remote Desktop Connection client software. This article will show you how to sign up with your free trial of the TZO Dynamic DNS service and configure your Linksys router to gain remote access on a remote computer. The host computer (i.e. a computer from work) is where you will establish remote access. To learn more on how to do this, check the Microsoft® website. The client or remote computer (i.e. a computer at home) is the computer that you want to have remote access enabled within your network. Windows® 10 – Click the Windows button. Enter “remote desktop connection” in the search field then select Remote Desktop Connection. Windows 8.1 – Right-click the Start button then click Search. Enter “remote desktop connection” in the search field. Click the Remote Desktop Connection icon. Windows 8 – Press the Windows button from your keyboard then enter “remote desktop” and then click the Remote Desktop shortcut in the Apps section of the screen. Windows 7 – Go to Start, enter “Remote Desktop Connection” in the Search field and click on Remote Desktop Connection in the list of results. NOTE: In Windows 7, Remote Desktop Connection is installed by default. 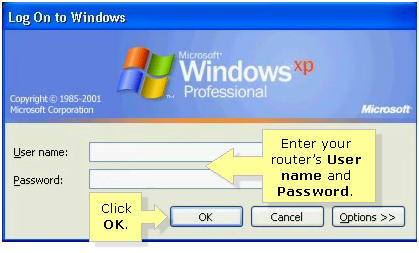 Windows XP/Windows Vista® – Go to Start > All Programs > Accessories > Remote Desktop Connection. NOTE: In Windows Vista, you may also enter “mstsc” in the Search field on the Start menu. Remote Desktop Connection is installed by default. Set a static LAN IP Address on your remote computer to enable the computer to have the same IP Address every time it reboots so it wouldn’t be disconnected from your host computer. To learn how to set a static IP on your computer, click here. QUICK TIP: A static LAN IP Address is also called fixed IP Address. Port range forwarding is done so the data for Internet applications can pass through the firewall of the router or gateway. For instructions on how to configure the port range forwarding feature in your router’s web-based setup page, click here. NOTE: For Linksys Wi-Fi users, click here for instructions. Access your router’s web-based setup page by clicking here. NOTE: If you’re using a Mac® computer to access the web-based setup page, click here. Under Setup, click DDNS and select TZO.com. Enter your E-mail Address, TZO Key and Domain Name in their respective fields. IMPORTANT: The free TZO Dynamic DNS service you signed up for expires in one (1) year. When upgrading to a paid TZO account, make sure to do so before it expires. Also, provide the TZO ordering system with the same domain and email address so the credit can be applied. Test the Remote Desktop Connection within your LAN. The test will ensure the remote computer is actually running and accepting connections from another computer on the same network. On a test computer, click Start > Programs > Accessories > Remote Desktop Connection. In the Computer field, enter the static LAN IP Address you set on the remote computer. Then, click Connect. Enter your router’s User name and Password then click OK.
You should now be able to view the files, programs and settings that your remote computer contains. If you cannot connect within the LAN connection, something went wrong with either your server setup or the test computer. Verify if both systems are online and can communicate with each other using another method such as network browsing using file explorer, and ping test. Also, make sure the Remote Desktop Connection client software is enabled. You may need to temporarily suspend or disable software firewall such as Symantec Internet security, or the Windows Firewall to see if those were the problem areas. If so, contact the firewall vendor support for additional help. Click Start > Programs > Accessories > Communications > Remote Desktop Connection. Enter the TZO Domain Name in the Computer field and click Connect. NOTE: In this example, Name.LinksysNet.com is used. If you cannot connect at this point, make sure you successfully performed the LAN testing of Remote Desktop Connection. Have someone at the remote location check that the host computer is power up and that you have the Windows Remote Desktop Connection client software enabled. You should also check that you are using the correct TZO Domain Name and that you also check if the port is opened properly in the router.